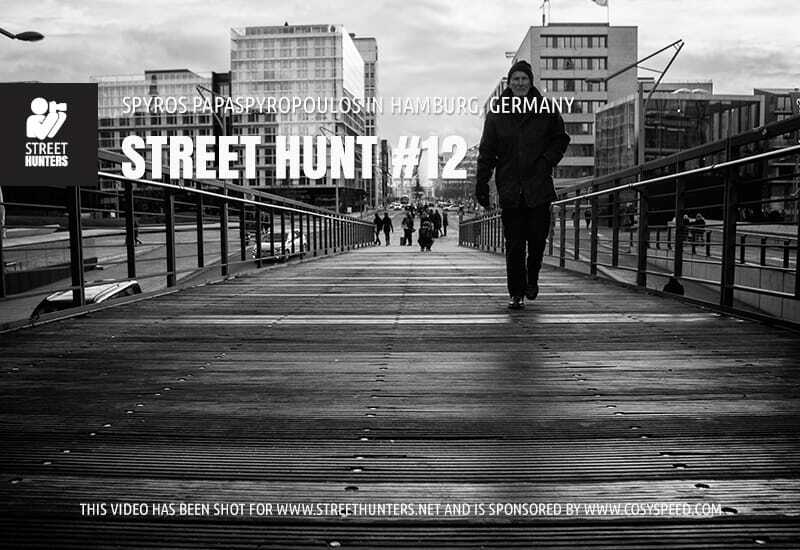 About a month ago, on the 12th of December to be precise, I flew to Hamburg in Germany to record a Street Hunt video, sponsored by our friends at Cosyspeed. Cosyspeed for all of you that don’t know is the German company that makes the high quality Camslinger camera bags that can be worn around your waist or your shoulder. My trip lasted from the 12th of December to the 15th of December and 2 days after I returned to my base in Crete, I wrote a detailed post about my experiences there as a Street Hunter. If you haven’t read the post “Street Photography in Hamburg, Germany”, I recommend you give it a read before you watch today’s Street Hunt video, as it will prepare you nicely for what you will see. Visiting a foreign city and country to film a Street Hunt was a challenge for me. I was concerned about the German laws of privacy a lot before my trip and I was trying to think of ways to photograph in the street without showing faces. I had a talk with Thomas Ludwig of Cosyspeed before I arrived to Germany and he reassured me not to worry. After a few minutes of Street Hunting in Hamburg, I saw that the people of the city didn’t mind to be photographed. Some reacted very positively to it and that was a pleasant surprise to me. During my time there, I didn’t shoot much alone. I was accompanied most of the time by a Street Hunter or more, so I felt comfortable enough to forget about my initial concerns and I just had a blast! Hamburg is an amazing city. It has it all. You can shoot street in the old neighbourhoods or the posh parts of the city, by the port, in the Underground stations, on bridges, in streets with big buildings made of either glass or red brick, the possibilities are endless! Any Street Hunter could spend 2 weeks in Hamburg and still find new things to shoot every day. Saying that, I wish I had more time to stay there. I am thinking back at my visit and remembering things that I missed, places that I never got a chance to visit and I wish I had managed to have covered more ground. I did my best though. A total of 22 hours on the streets rewarded me with a few keepers. The day of the Street Hunt alone I walked for 12 hours and recorded about 8 of them. From those 8 hours, I have managed to make a 30 minute Street Hunt video. In this Cosyspeed sponsored Street Hunt video I use my APS-C Sony NEX-6 with various settings, depending on the situation but I mostly used an open lens at f 2.8 with Autofocus. The Sony NEX-6 Autofocus is quite great actually. I also use this camera in Manual Focus but for Hamburg I chose Auto and it didn’t disappoint. The lens I use is the SEL20F28, a 20mm f2.8, by Sony that is equivalent to 32mm full frame. Grab yourself a comfortable chair and relax. Grab some food and your cold or warm beverage of choice and enjoy this month’s Street Hunt filmed in Hamburg, sponsored by Cosyspeed! In addition to the video I have made a collection of all the photos I shot. If you want to check out each photo I have uploaded every image I shot in a dedicated Dropbox Album called Street Hunt #12. Spyros, your answer on why you do not shoot the homeless was just perfect. Personally, I do not shoot homeless or handicapped people unless for journalistic purposes as you said. However, the reason for not doing so could not be expressed better than what you said regarding their privacy. I hope you do not mind me borrowing your answer from now on. Hi Mavritivs. I am happy you agree with my answer. You can certainly borrow it from now. Great interaction with the officer. Also I learned alot from the composing and waiting for the pedestrian in the right place. Often quoted, “A good hockey player plays where the puck is. A great hockey player plays where the puck is going to be.” Wayne Gretzky Thanks for sharing! Andy, thank you very much for your kind comment. As for composing, I am glad that you feel that you learned from what I shared. It makes me want to push on and make more videos.